Automotive consumers have more devices than ever—and they’re spending more time using them. eMarketer estimates that total time spent with media will continue to rise thanks to the multitasking, multiscreen media experience enabled by digital, and especially mobile devices, tablets and "Phablets". 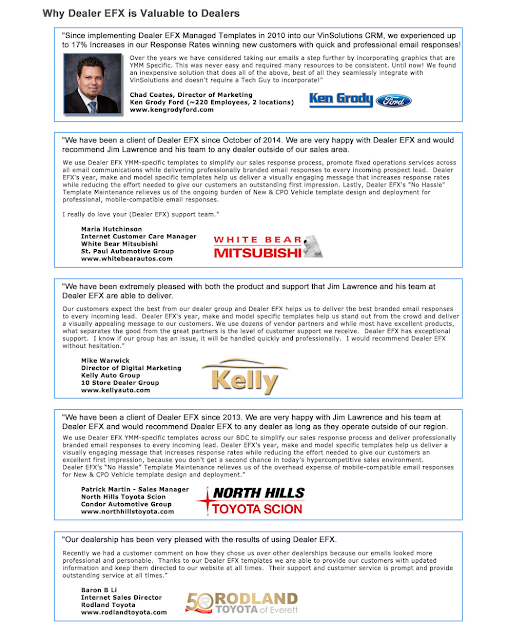 eMarketer.com has curated a "Roundup Document" of articles, insights and interviews to help marketers understand their audience’s cross-screen behaviors and reach automotive consumer targets on a variety of devices. Time spent with mobile devices has grown at a torrid pace over the past five years. In 2011 and 2012, growth was nearly in the triple digits, as more and more consumers adopted and quickly became addicted to smartphones and tablets. The pace has cooled significantly, to the point that eMarketer now expects growth of time spent with mobile to fall to the single digits in 2016. It will be the first time that mobile usage has grown at such a slow pace. 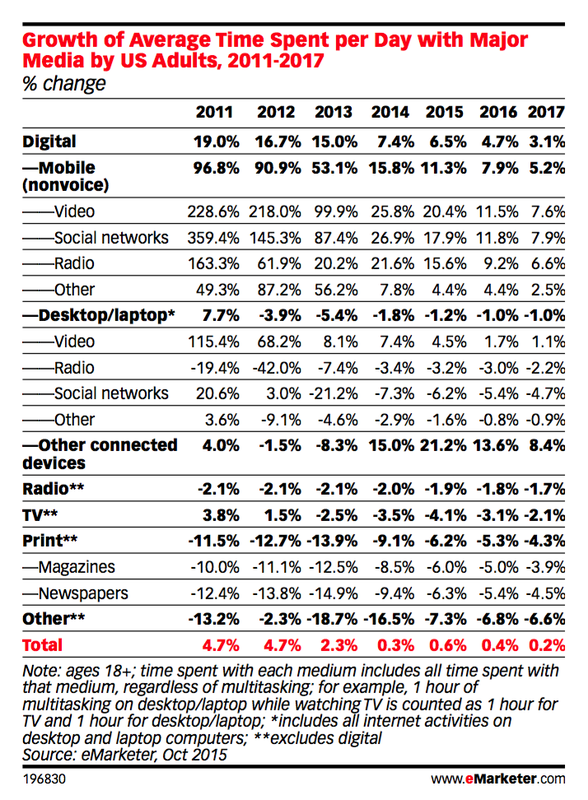 Still, mobile is the only major channel we expect to grow (in terms of time spent) this year and next year. 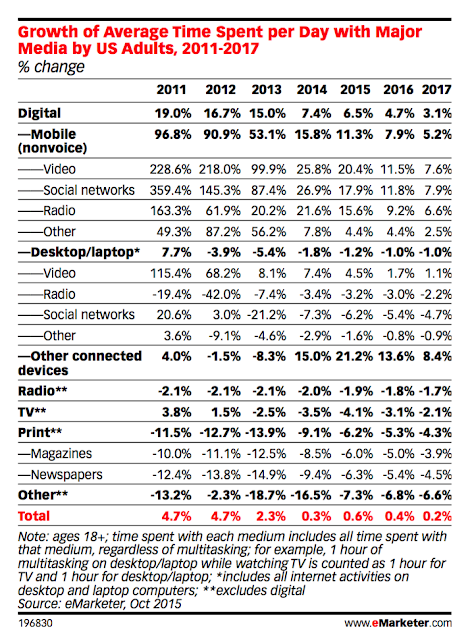 Time spent with every other major channel—TV, desktop, print, radio— will decline. As a result of mobile’s slowing growth, we expect the growth of total time spent with media, after rising rapidly earlier in the decade, to level off. Total time spent with all types of media will be 12 hours per day this year, an increase of just 3 minutes over 2014. It will edge up only a further 5 minutes, to 12 hours and 5 minutes, in 2017. Consumers are continuing to shift their media habits to the same, or similar, content, but different screens. For example, video consumption will hold relatively steady over the next couple years, but the way people are viewing video is continuing to change. The same pattern is occurring even more starkly with radio listening, which will be more than 40% digital by 2017. Digital video viewers stream their favorite TV shows to PCs and mobile devices all day—and all night. According to 2015 data on when accompanying pre-roll video ads were served, daypart plays a role in determining which devices they use. 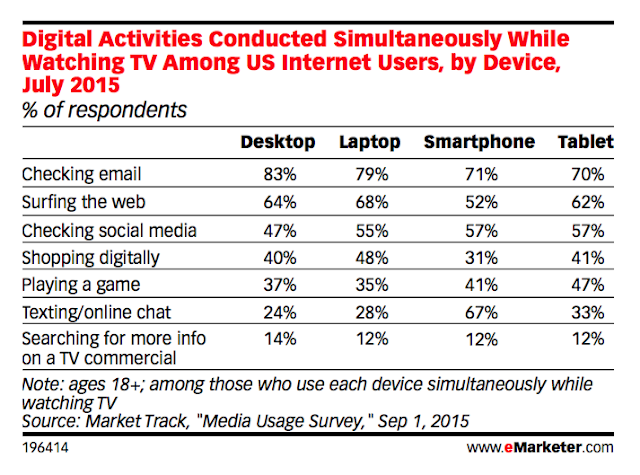 Mobile devices, including tablets, appear to be more congenial to late-night viewing. According to TubeMogul data about activity on its platform from April through June 2015, among pre-roll ads supporting streaming TV being viewed on computers, just 12% were served overnight, from midnight until 6am. On mobile phones, the overnight share of pre-roll ads was more than twice as high, at 25%. Tablets saw a similarly strong 22% of streaming TV ads served between midnight and 6am. Evening viewing was stronger on all mobile devices, but heaviest on tablets. More than two in five (41%) streaming TV pre-roll ads served to tablets were served between 6pm and midnight. That compared to 29% of ads served to mobile phones and 33% of ads served to computers. A majority of TV streaming to computers occurred during the day, with 56% of ads served between 6am and 6pm. For mobile phones, the daytime share was 46%, and for tablets just 37%. Q2 2015 data from FreeWheel Also found a stronger daytime share of digital video ad views for desktop and laptop computers, along with higher nighttime usage of smartphones and tablets. The FreeWheel data also included over-the-top (OTT) devices, which had the highest concentration of primetime and late-night viewing of any device—and among the lowest daytime viewership. Results such as these are common, and mesh with what media consumers report about their device usage habits. For example, they still watch lots of TV—at least for now. According to Nielsen, US adults ages 18 to 24 watched more than 18.5 hours of traditional TV per week, while those in the 25-to-34 age group watched nearly 25 hours per week. While this is less time spent than older generations, it still made up the majority of millennials’ media time. 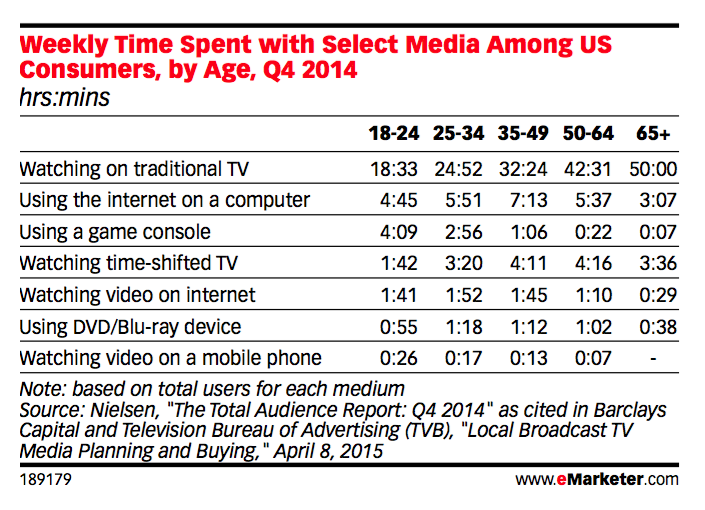 Time spent watching video on TV is still greater than on other devices. 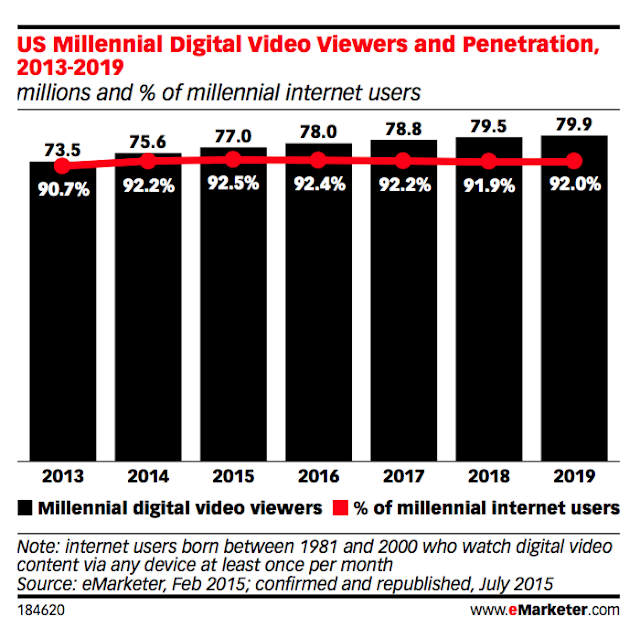 However, with the proliferation of mobile devices entering the market and multiscreen usage growing, video habits are shifting. Millward Brown, which surveyed—via smartphone or tablet—more than 13,500 16- to 45-year-old multiscreen users across 42 countries, found that half of all video viewing happens on TV sets—split between live TV and on-demand TV. The other half comprises mainly mobile devices, which includes smartphones and tablets. Smartphones take the largest digital share, encompassing 22% of total daily time spent viewing video. 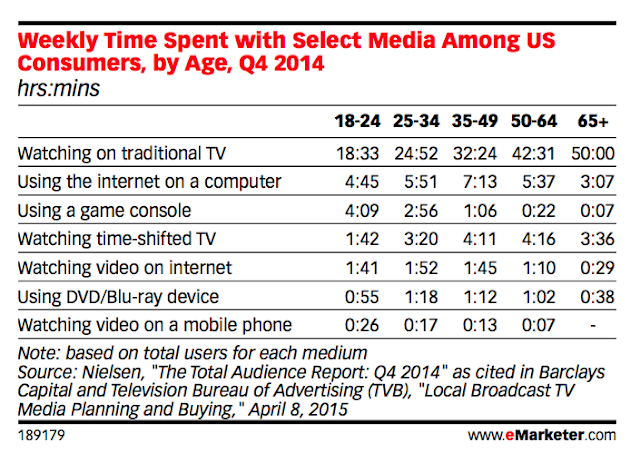 Breaking it down by age, daily time spent viewing video via a TV set is greatest among 33- to 45-year-olds. Smartphones, on the other hand, are the primary video viewing channel among 16- to-24-year-olds. Although this is their core video platform, this group also watches a lot of video on live TV, on demand TV and via their laptops. The rise in mobile video viewing is part of a larger transition to multiscreen usage. In fact, mobile users worldwide spend 52% of their daily internet and viewing video time on mobile phones. To compare, the share of daily time spent with computers makes up 21%, while TV accounts for 27%. Because a majority of video content out there is free, video advertising comes with the territory. And, unsurprisingly, mobile users are not very receptive to it. 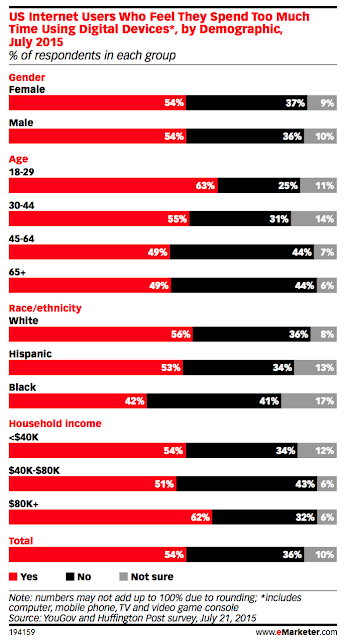 In the US, only 19% said they are open to digital video ads. Hence, there is work to be done to enhance the video experience. More than a third of mobile users worldwide said they would be less likely to skip digital video ads and pay more attention to them if they were funny or humorous. Other top reasons included watching an ad if it was in a category they were interested in, if it gave them something in return or if it was for a brand they were interested in. 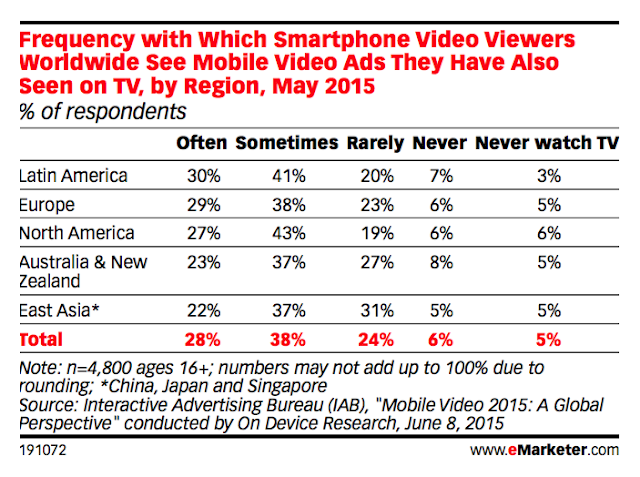 User attitudes toward video advertising are a hurdle marketers need to overcome. A separate July 2015 study from Unruly found that 81.4% of US internet users muted digital video ads. Clearly users are not fond of them, but marketers must look at ways to have users pay attention, whether by making it appealing or through an incentive. Smartphone video viewing is a nighttime, at- home activity. According to May 2015 research conducted by On Device Research for the Interactive Advertising Bureau, smartphone video viewers worldwide were most likely to watch via such devices between 8pm and 11pm. As such, and despite smartphones’ on-the-go factor, viewing was most likely to take place at home, with 90% of respondents reporting watching smartphone video at home, vs. 49% who watched it away from home. Most respondents hadn’t cut back on TV time too much, as just 22% said they watched less television because they viewed video on their smartphones. 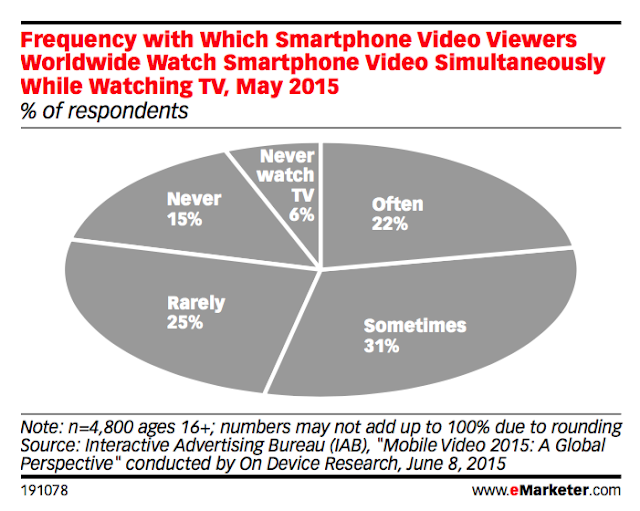 However, smartphone video still found its way into the TV viewing experience for the majority of respondents. Fully 53% said they watched smartphone video simultaneously while watching TV. The study noted that multiscreening was a two-edged sword. While it could potentially “offer a pathway to creating more engaging and creative multimedia campaigns,” it also presented marketers with the challenge of maintaining viewers’ split attention. January 2015 research by IAB also found that 69% of US smartphone-owning internet users—not limited to video viewers—used such devices while watching TV. Possibly in an effort to reach these multiscreen viewers, IAB’s May 2015 study found that many advertisers were repurposing the same TV advertisements for mobile. Fully 28% of respondents said they often saw ads on mobile video that they had also seen on TV, and an additional 38% saw them sometimes. Just 6% never reported seeing this. Though this may seem like a good way to reach dual- screening viewers, IAB noted that “marketers might be missing out with this approach,” as it limits them from satisfying consumer demand for relevant mobile placements. Fully 82% of respondents said the ads that appeared in mobile videos should be tailored in any way so they were of interest, vs. 18% who didn’t care if they were tailored at all. The most-desired tailoring was to include ads related to the video being watched, while viewing history, context and location also mattered. Market Track found that more than half of US internet users watch commercials on TV, as opposed to fast-forwarding through them, channel-surfing or simply leaving the room when they came on. 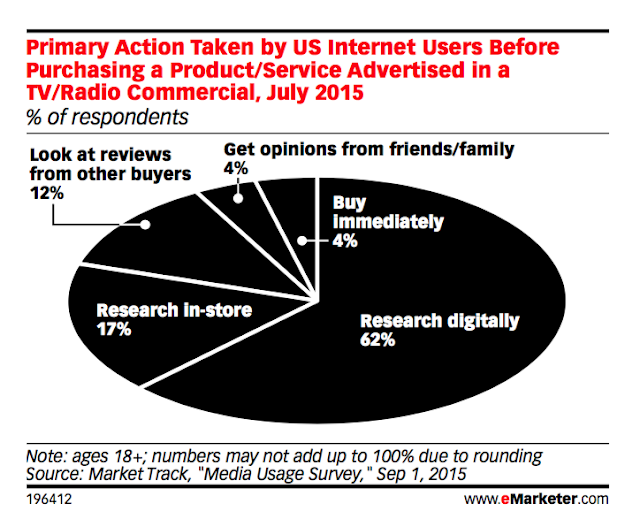 And when commercials do spur viewers to act, digital research is far and away the most common response. Another 17% research items in-store. a second screen besides the television. Nearly half of internet users polled by Market Track said they used a laptop while watching TV, and 42% used a mobile phone of some kind. Tablets and desktops were less popular, but still used by around a quarter of respondents. Only 21% did no multitasking. Shopping while watching TV was a common activity among second-sceeners. Nearly half of those using a laptop did so, along with 41% of tablet users, 40% of desktop users and 31% of smartphone users. all devices, though checking social media was also more common on smartphones. Perhaps surprisingly, research has suggested that second- screening draws more attention away from shows than from ads, though TV advertisers are still looking to digital video to get their commercials in front of mobile users who may not be paying attention to the traditional TV set.